Make sure you pack some olives, anchovies, tomato paste, mozzarella, basil and flour as you will be making a tasty treat in the pizza oven! And then consuming it with a bottle of red around a modern comfortable dining table. You can set the tone of your relaxing and memorable holiday right here amongst colourful artworks and modern decor in this delightfully modern 4 bedroom holiday home. 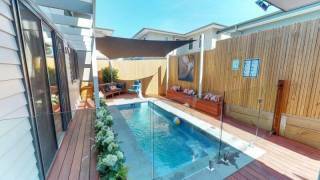 Raven Retreat, a stunning beach house with 10 M solar and gas heated pool for year round usage, located in old Ocean Grove, quiet street a holiday retreat in itself. 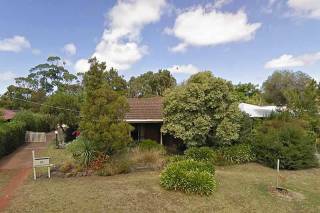 A fantastic destination to explore the Bellarine or just stay and enjoy your own personal retreat. 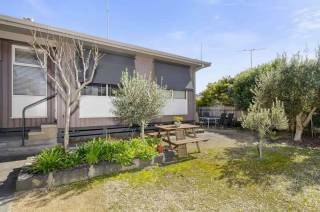 A short walk to shops, beach, restaurants, supermarkets, and all Ocean Grove has to offer. 15-20 minute drive to Queenscliff, Pt. Lonsdale, Geelong, Torquay, Portarlington, St. Leonards, Portarlington Olive Groves, Wineries, Wallington Adventure Park, Golf Clubs, and much more. One hour drive to Lorne via the Great Ocean Road. A stunning property for families to enjoy the amazing facilities offered at this ‘Retreat’ location. Raven Retreat has 4 large bedrooms plus office/bedroom 5 - main bedroom has king bed with en-suite, 2nd bedroom has queen bed and single bed with trundle, 3rd bedroom has two trio bunks (double bed on bottom, single bed on top), 4th bedroom has queen bed and double futon, 5th bedroom (study) has double futon and single futon, the bedrooms are supported by 4 bathrooms including showers and bath and 4 toilets, catering for a total of 16. The living areas include TV, DVD, stereo, iPod dock station, and there are 10 TV’s around the house, with Foxtel access to 8 of the 10 TV’s. There is even a TV in the luxurious bathroom which has a freestanding bath to sit back relax and enjoy a glass of bubbly. A fully equipped office with wifi, internet access and printer is also included. Raven Retreat includes a wonderful kitchen featuring 2 ovens, large fridge with filtered water and ice maker, mirror splash-backs, double drawer dishwasher, servery windows opening to the alfresco dining and BBQ area. There is also ample crockery, cutlery, glasses, serving platters for holiday and week-end entertaining. The immaculate kitchen overlooks the lovely outdoor alfresco area with polished concrete floors, built in outdoor kitchen with fridge, sink and mains gas connected to BBQ. A bio ethanol fireplace and outdoor heat strips complete the picture, and keep you warm all year round. This area also includes a 50inch TV with Foxtel access, AND A PIZZA OVEN. There is an outdoor cubby house to keep the little ones entertained, and an outdoor shower that can be used after a trip to the beach (just in case you want to leave the resort!!!). The pool at Raven Retreat is solar and gas heated, has a water feature and feature lighting to add to the ambiance. An amazing Pool House which includes bathroom No. 4 (shower, basin, toilet) infrared sauna, TV and gym with spin bike, situp-bench, boxing equipment and weights add to the features. The pool house has bar and bar stools with bi-fold windows overlooking the pool, JUST ANOTHER PLACE to enjoy a beer, wine or just watch the kids in the pool. An undercover cabana area also overlooks the pool/alfresco area, with comfortable seating for 4 people. There are 4 sun-beds by the pool and extra bench seats if required. All this set amongst fully landscaped gardens at back and front with high rendered walls surrounding the rear and front of the property for privacy.